Talented artist Sova Huova instructs art enthusiasts in drawing, inking, and coloring techniques; explores abstraction for expressive artwork; and gives tips for digital touches—all with easy-to-follow instruction. Beginning with an introduction to tools and materials, artists will find helpful tips for working with inks, pens, and watercolor. Inking Animals features a wide range of creative and fun inking techniques and unique projects that are simple and engaging. Huova’s valuable tips and tricks, creative prompts, and exercises will encourage artists to experiment and play as they learn. 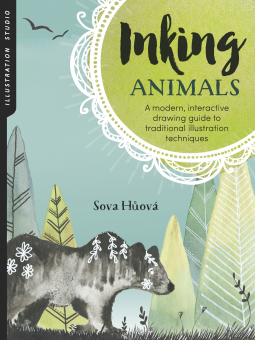 Huova will teach you to illustrate a vast menagerie of animals from the woodland, home, farm, wilderness, and imagination. Among them are a bear, fox, hedgehog, dog, guinea pig, donkey, owl, raven, and even a unicorn. Cassandra's Review- The book is super creative, but will be very time consuming for a new beginner to recreate. It will take lots of practice for me and the kids to get the directions right, but it is really fun to keep learning and trying.